As Lowkey says in the intro: it’s been a long time coming. Twenty-five-year-old rapper Lowkey (aka Kareem Dennis) has been well-respected on the underground hip-hop scene since he was a teenager, winning notoriety for his humorous battling style and rapid-fire lyricism. But it was a few years into his career, in early 2009, that he really emerged as the leading voice in the “soundtrack to the struggle” – making music representing the hopes and dreams of oppressed peoples around the world; people struggling for freedom and equality. A key moment in this process was the massive rally in Hyde Park on 10 January 2009, protesting against Israel’s brutal bombing campaign against Gaza. 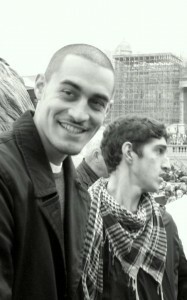 Lowkey’s impassioned acapella performance of the poignant ‘Long Live Palestine’ (which has since become a massive hit) caught a lot of people’s attention, and Lowkey quickly became a leading voice in the anti-war movement, one of very few with the ability to put radical ideas in a form that young people can relate to. Since then, Lowkey has released a string of hits and established himself as the leading voice of political hip-hop on these shores (in addition to gaining the respect of some of the major radical voices of US hip-hop, such as Dead Prez and Immortal Technique). The reach of his singles has been unprecedented for a fully independent artist with no mainstream media support. His tracks ‘Terrorist’ and ‘Obamanation’, both hard-hitting pieces of political and social commentary exposing the lies and hypocrisy of imperialism, have received 1.6 million and 1.4 million YouTube views respectively. A generation of young people has been inspired and educated by these songs, which have successfully captured people’s imagination in a way that the many organisations bringing a somewhat similar message have failed to do. And although there are a few that want to ghettoise him as a ‘Palestine rapper’, Lowkey has continued to make music about police brutality, about respect for women, about the music industry, Cuba, Diego Garcia and much more, and has collaborated with leading London rap voices such as Wretch 32, Klashnekoff, Akala, Black the Ripper and Sway. In addition to his music, Lowkey has also spoken at meetings, rallies and pickets up and down the country, speaking out against war, racism, islamophobia, government cuts and police brutality. He has taken his skills and knowledge around the world, speaking and performing in the US (alongside respected anti-zionist academic Norman Finkelstein), Palestine and Australia. Along with activist Jody McIntyre and rapper Logic, he has formed the Equality Movement, bringing young people from different ethnic, political and religious backgrounds together to learn and act in the struggle for a better future. A true activist-musician, he’s as comfortable with the megaphone as he is with the microphone. Throughout these last nearly three years of intense activity, the anticipation has been growing for a Lowkey album – a body of work that sums up his experiences, and our whole generation’s experiences, over the past few years; years characterised by imperialist wars in Iraq, Afghanistan, Palestine and Libya; bombings of Pakistan, Somalia and Yemen; global economic crisis; massive cuts to public services in most of the affluent countries; and rising resistance to the status quo. Although Lowkey’s debut album, Dear Listener, appeared in mid-2009, and was a very solid release, it was clear that it was a prelude to his first major album, which has finally arrived in the form of Soundtrack to the Struggle. And it’s a classic. No weak tracks, no cringe moments, no need to skip or fast-forward; just 20 exceptional pieces of thought-provoking and soul-stirring music. I don’t think it’s an overstatement to say that this album sits comfortably alongside the best UK hip-hop releases of all time (such as Skinnyman’s “Council Estate of Mind”, Rodney P’s “The Future” and Klashnekoff’s “The Sagas”). Furthermore, given the international relevance of the subject matter and the intensity and lyrical ability Lowkey brings to the table, I would argue that Soundtrack to the Struggle deserves a place alongside the best political/radical hip-hop releases (such as Dead Prez’s “Let’s Get Free” and Immortal Technique’s “Revolutionary Vol. 2″). The next track, ‘Too Much’, featuring the singing talents of Shadia Mansour, has a clear message about the dangers of our society’s obsession with money, asking “Do you possess money or by money are you possessed?”. The recently-released video, shot in Havana, contrasts this money madness with the simpler and more altruistic life favoured in Cuba. Track 3 will already be known to most of you – ‘Voice of the Voiceless’ featuring radical New York-based hip-hop legend, Immortal Technique. ‘Hand on your Gun’ is a new track over a ridiculously funky Show’n'Prove production, exposing the sinister forces behind the weapons industry. Next up is a skit based on a firing speech by Reverend Jeremiah Wright that, in two minutes, tells you everything you need to know about imperialist state terrorism. “Violence begets violence, hatred begets hatred, and terrorism begets terrorism”. This of course provides the perfect introduction to ‘Terrorist’, Lowkey’s biggest track to date, and probably the most widely-discussed piece of music of 2010. After ‘Something Wonderful’, the video for which was released early last year, comes a new cut, ‘Dreamers’, a deeply personal track dedicated to the dreamers: not the people that “see things that are there and ask why”, but the people that “see things that aren’t there and ask why not”. The emotional lyrics and tight flows work perfectly alongside Mai Khalil’s wistful adlibs and the acoustic instrumental (which you will almost certainly recognise!). A clip of a speech from well-known activist/journalist Tariq Ali, assessing the record so far of US President Barack Obama, sets the scene nicely for ‘Obamanation’, which, although released back in March 2010, only gets more relevant with the passage of time. Next up is ‘Cradle of Civilization’ featuring Mai Khalil, a haunting and moving tune devoted to the homeland Lowkey has never seen: Iraq. In the new track ‘Everything I Am’, heavyweight producer Show’n'Prove again comes through with the goods with a phenomenal sample flip. Lowkey explores his own identity and how he is perceived, particularly by his fans. The next skit, introducing ‘Long Live Palestine’, is based on a beautiful and deeply moving speech by Norman Finkelstein, explaining why he, as a Jew, feels compelled to support the struggle of the Palestinian people. This will make you cry. My late father was in Auschwitz, my late mother was in Madjanek concentration camp. Every single member of my family on both sides was exterminated. Both of my parents were in the Warsaw Ghetto uprising. And it’s precisely and exactly because of the lessons my parents taught me and my two siblings that I will not be silent when Israel commits its crimes against the Palestinians. And I consider nothing more despicable than to use their suffering, and their martyrdom to try to justify the torture, the brutalisation and the demolition of homes that Israel daily commits against the Palestinians. So I refuse any longer to be intimidated by the tears [of Zionists absolving themselves of any crimes by making reference to the Nazi holocaust]. If you had any heart in you, you would be crying for the Palestinians. The next new track is ‘We Will Rise’, an optimistic tribute to those fighting against empire, in particular against its disastrous impact in the Arab world over the course of the last century. The track ends with a powerful poem from young Yemeni-British poet Sanasino. After ‘My Soul’, the video for which was leaked in July, comes another deep new track, ‘Butterfly Effect’, produced by the highly-respected New York production team Beatnick and K-Salaam. Lyrically a very deep and unique track, ‘Butterfly Effect’ sees Lowkey giving voice to a disabled homeless war veteran and exploring how events and decisions have repercussions that we can never predict. The beautiful sung chorus, solemn instrumental and powerful storytelling make this one of the standout tracks of the album. Next comes ‘ObamaNation Part 2′, the video for which was released just a few days ago, and which has become an instant classic. Three intense verses – from M1 (Dead Prez), Black the Ripper and Lowkey – over an epic Nutty P production. Then we have another new BeatNick and K-Salaam produced banger, ‘Dear England’, featuring Mai Khalil. The grime tempo/feel is a welcome change of pace and gives Lowkey a chance to show off his double-time skills, very appropriate for this insightful track about the recent London riots. ‘Haunted’ is perhaps the most personal, reflective and fragile moment of the album, as Lowkey gives the listener an insight into some of the psychological conflict he deals with daily, haunted by the memory of his brother, ground down by the stress of his ongoing court case, and lied about and misrepresented in the press. He ends by urging the listener to remember: “When I go, just know, that I did it for the people”. The penultimate track is the long-awaited ‘Terrorist Part 2′, featuring the young London-based Iraqi rapper Crazy Haze taking the role of a barrister defending Lowkey against charges of ‘inciting terrorism’ with his music, and then as a prosecuting barrister cross-examining Lowkey. An innovative and interesting track over a tasty Last Resort beat. And there you have it. Twenty phenomenal tracks that make you think and make you feel. An album worth waiting for. I’m sure there will be many more albums to come from Lowkey (who at 25 years of age displays a remarkable musical, lyrical and political maturity), but it’s not going to be easy to top this. The album is released on 16th October. Here is the iTunes pre-order link. If you are a Lowkey supporter, please do your best to spread the word about the album far and wide! There is no multinational corporation sponsoring this music; it is our music; music for the people. If we don’t support it, it can’t continue. This is truely going to be the best album of 2011, and the best of lowkey, i recommend everyone to purchase this album and support one of the real artists! And it is a great achievement that its number 15 now or so on the Pre-ORder Itunes List with no industry back up. Waiting for this for so long but I don’t want to only have it in mp3. Anyone know where you can pre-order it on CD because amazon.co.uk only have it as mp3 download? As far as I know Lowkey himself said the album is available only in electronic form for now. but the industry & Media controllers might not let it get to the top, as it’s mentioned in the article, it’s *our* music, the people’s! Finally, lyrics worth listening to. Enough said. Definitely up there with the best UK Hip Hop albums ever released. Great review, brilliantly written. Thanks. Mat, Australia. you know what ive been following lowkey for a very long time. and hes not like the others immortal teqhnique etc..he has a natural talent and the passion in his voice is beautiful.we need more people out there like him..the album is well worth it i wud buy it at even 40 quid….LONG LIVE PALESTINE LONG LIVE GAZA! Where can i get Lowkey album in South Africa?